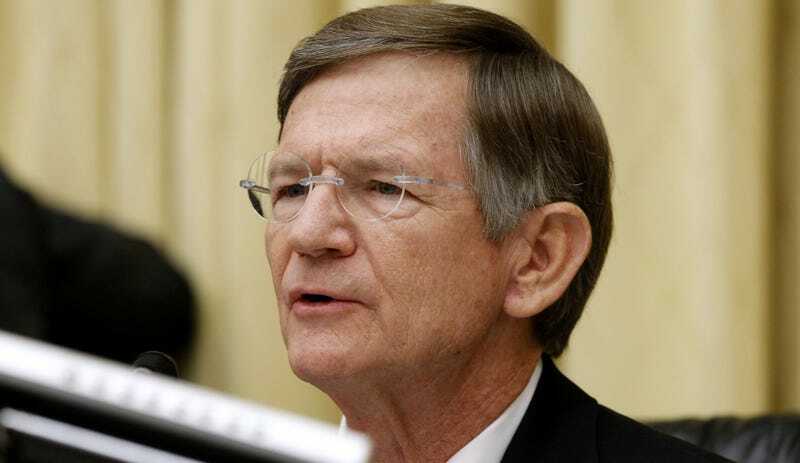 As congresspeople deliberated yesterday—before the GOP bid to destroy the Affordable Care Act devolved into a colossal train wreck this afternoon—Lamar Smith, the Chair of the House Committee on Space, Science and Technology, slipped away from the discussions so he could go hang out with climate change deniers and remind them that the media is liberal, according to a report by Motherboard. He also bragged about all the times he subpoenaed the Environmental Protection Agency. We thought this would be a good moment to remind you, reader, that the guy in charge of the committee with the words “space,” “science,” and “technology” in its name doesn’t have much experience with any of the above—unless you count being from the same state as the Johnson Space Center. Smith went a college preparatory school called the Texas Military Institute, now called TMI, The Episcopal School of Texas, for high school. I am sure he received a wonderful education there. He won a science award funded by eye health company Bausch and Lomb, according to an article published in Science. Today, the prerequisites for that award seem to be a nomination from a high school and good grades in science classes. Fine, Smith had good grades and took science classes in high school. So, seeing his peers in an introductory physics course was enough for Smith to realize he wasn’t a “future Einstein.” But lots of people at his undergraduate alma mater, Yale, need to take introductory physics courses aside from physicists—doctors, biologists, and geologists for example. Today at Yale, there are even several levels of introductory physics courses with varying prerequisites. Anyhow, Smith didn’t graduate with any science degree (if you find his transcript, please email it to me), which could have helped him master the scientific method and understand the importance of evidence, or the nuanced issues the field deals with. Instead, he graduated with an American Studies degree, which is fine, but a high school science award and a freshman physics class should not be enough to oversee policies that affect American science and scientists. From college he went on to be a journalist, according to the Congress Biographical Directory, and to get his law degree from the Southern Methodist University School of Law. Then he became a lawyer in a private practice before entering the government. The House’s Committee on Space, Science and Technology, chaired by Smith since 2013, at least partially oversees a lot of departments stocked with scientists. NASA. The Environmental Protection Agency. The Department of Energy. The National Science Foundation. The National Oceanic and Atospheric Administration. The that agency helped get us to the moon oversees the people in charge of forecasting the weather and it oversees our nuclear energy matters. These agencies staff scientists because they deal in matters with complex science-based elements, issues that directly affect the lives and safety of Americans. I don’t care if they are a Democrat, a Republican, or a guy with a boot on their head. I just ask, why isn’t a scientist, or at least someone who demonstrably understands how science works, leading the House Science Committee?